Every business is different. That’s why, at TRP our approach is unique, we don’t try to fit your needs into our solutions; we tailor our solutions to meet your needs. To ensure we meet this goal, we start from the beginning and take nothing for granted. Have you ever stopped to consider how much of your time is taken up booking skips and arranging permits? Or the man hours lost filling them. Maybe it’s time for a change ? Call us at TRP and let us save you time and money with our competitive rates and great service. Our clearance teams will take care of everything and provide you with the relevant documentation to ensure compliance with UK waste legislation. We offer fast and effective removal of waste for many of Surrey’s leading estate agents/letting agents and property management agencies. Surrey based Housing associations, building contractors, retail premises and storage facilities. Our services include removal of construction and renovation/refurbishment waste, void clearance, removal of fly tipped materials from anywhere inside or outside your premises. Broken pallet / packaging removal ,office clearance. In short we will remove almost anything from your premises and will recycle as much as possible. Since July 2005 the EU landfill directive has required that plasterboard and other waste gypsum products must be recovered and recycled wherever possible. TRP offers a plasterboard collection service. This will then be disposed of at a specialist recycling facility. We can also remove certain Hazardous Materials, including paint /paint cans full of paint, solvents, motor oils, petrol cans, asbestos, vehicle batteries or noxious chemicals. There are certain items that are technically classified as hazardous (because of how they need to be disposed of) which we can collect i.e. fridges or freezers and computer monitors. But because these items have to be disposed of separately and the disposal costs are higher, we have to add a supplemental charge to your bill. If you are unsure about whether your junk is or is not hazardous and whether we can collect it, please call us on 0800 138 9100 for assistance. We are licensed or insured to carry certain hazardous materials. Methods of payment include: cash ,cheque, credit/debit card, BACS on terms to suit client. Hours of business: 6am – 6pm 7 days per week. 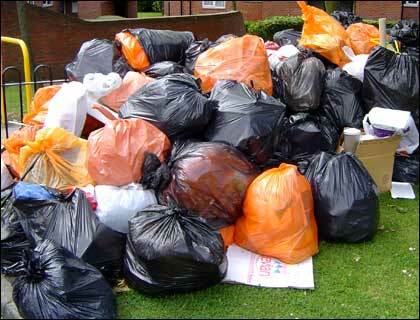 Out of hours waste removal available on request at no extra cost. to minimise costs. It’s not an easy equation to balance, but it can be done. TRP have a rapidly growing reputation for doing so.